These are simple hats with just a bit of elegant detail in several sizes. This version is for straight needles. There is an in-the-round version available. There are also patterns available for coordinating baby blankets. Cut the yarn with several inches to work with. With a yarn needle, pull the yarn through all the remaining loops, seam side, secure and weave in end. Love this pattern thank you so much. I wish my seams looked better. Thank you so very much for all the patterns you share. I’m a member of Knitting Paradise, and many member’s use your patterns for gifts for loved ones, and reccomend your site as and a link very highly. I too often come here to look at your beautiful pattern, their all a beautiful work of art! Thank you again for sharing your beautiful works of art. There is a straight needle version in the comments of that pattern. I just stumbled upon your patterns. They are AWESOME! I haven’t knitted in 30 years, and I’m getting back into it. Your patterns look like what I always loved about the craft. Thank you for sharing you talent with us! I just found your patterns while looking for a baby hat pattern! BLESS you for sharing these wonderful patterns!! You made my day!!!! I consider myself still a beginner so I want to be sure I understand what you mean by S2KP2. I don’t want to guess wrong and have to do over. Ah never mind I found your instruction on this…..crossing my fingers I do it right. Use the needle size recommended by the yarn. For #4, it’s probably around 5mm. I think the small premmie might be too small. The premmie cast on would make about a 13″ hat, so pretty good size to stretch slightly for a newborn. Sorry but as i’m just learning how to use knitting patterns I don’t know much about them, so i’m just wondering if there’s a way to change the height so it’s less? The crown is 1-1/4″ tall. Knit just to within 1-1/4″ of how tall you want the hat and then begin the crown. When u say knit untill 4.25″ high is the inches or cm please? Please help me understand step 3 during the making of the crown of Pattern 1. (Row 3: * k2, ssk, k2, k2tog, k2 * k1) Does it mean that we have to keep on repeating the pattern within the * and end the row on K!. Please correct me if I’m wrong. I’m stuck at this point. Yes, repeat what is between the * across the row and then you should have one stitch remaining which you will knit. Hello! I am knitting this for a newborn – however I have only ever knitted adult beanies. 4.75inch plus the crown seems quite long? Or does it look shorter when on the baby as the crown stretches? I noticed that I could simply knit the body shorter, but I wouldn’t want it too short. Does anybody have any photos of this hat on a model? It does leave a little room at the top but also does stretch to the side which takes of some of the height. The bit of room allows the hat to be used for a few months. I don’t know if you can see pictures on Ravelry without a Ravelry account, but there are several pictures on babies on Ravelry. This is for the in-the-round version, but it has the same dimensions as the other. does “slip 2 together knitwise” mean that you do not slip them one at a time but rather as if you were going to do a knit 2 together? What does ‘ssk’ mean? Can’t figure this abbreviation out! Got it!! Thanks for your prompt help!! I have made three of your baby afghans and hat sets and love the patterns. You are very generous in sharing all your patterns with so many. I thank you! You are appreciated! I don’t have any mittens or booties patterns (yet), but always recommend ravelry.com for searching for patterns. All my patterns included on ravelry.com and they have a very detailed search feature to locate patterns with very specific requirements. Question: is the asterisk in the right place in row 2 under vertical stripes: body? I casted on 85. It doesn’t add up unless I am doing something wrong. I absolutely love this pattern. Thank you soo much for posting it. I made the square design and it turned out beautifully. I was wondering whether you’d be able to adapt the same design but to make full mittens and how that’d be done. I haven’t, but if you found a simple mitten pattern that your liked you could work the design on them. Thanks so much for the pattern! Knitting baby hats for the hospital and these are perfect! Thank you so much. I made one and love the easy to follow pattern. Also thank you for the no fuss site where you don’t have to sign up to get free patterns. Bless you. Much appreciated. Continue repeating those 8 rows until it is the pre-crown length needed. Work either a row 2, 4, 6 or 8 as your last row before beginning the crown. The crown begins on the right side, so the last row of the body needs to be a wrong side row. I am doing the square pattern and could you tell me what you mean by ending on an even row goes that mean a knit row awaiting your reply so I can finish this lovely hat. When you say slip 2 knitwise, are you knitting these two stiches together or just slipping onto needle. Also, s2Kp2,(slip 2 together, knitwise) k1, pass 2 slipped stiches together. Question: Slip 2 together knitwise, does this mean just slipping 2 onto needle or knitting these 2 slipped stiches. Question: Pass 2 slipped stiches together, what does that mean? To slip 2 knitwise, insert the needle as though you were going to knit them together, but don’t knit them. Just slip them onto the other needle. So for the complete stitch, slip 2 knitwise, then knit the next stitch. Then use the other needle to lift the 2 stitches that you slipped over the just knitted stitch and off the needle. So the result will be that for those three stitches, you will result with the third of the three knitted and the other two around it. Whenever you knit stitches together, one of the stitches always ends up on top. The goal of this stitch is to make the middle stitch the top stitch so that it looks like the two on either side disappear behind the center one. Do you cast off before sewing the seam? You don’t cast off in the traditional sense, but yes, you do pull the end of the yarn through the last stitches (therefore removing them from the needle) and secure them before sewing the side seam. So, no need to ” bind off”, but rather just pull needle out when done, use extra length of yarn, run it through all open loops of stitches and then….how do I secure them? I use a yarn needle with the “tail” of yarn in the eye to slip the stitches off the knitting needle. That prevents losing a loop. I insert the yarn needle back through the first loop and then through to the “inside” of the hat. I pull the yarn through a couple of loops nearby and then do that again but that time not pull it all the way so that I have a loop sticking up. I use the needle to twist the loop and then pull the needle through it and carefully pull it tight so that the loop reduces to a knot next to the inside of the hat. If that tail of yarn is long enough you can then use it to seam the edge and then do the same sort of knot at the other end to secure it. Mama, I see you’ve been fielding questions and comments on these hats since 2013. Hope you’re still at it. I’m getting back into knitting after a stroke. So, the first hat I found in my stash was on straight needles and liked it so much that I’m sending it to a great grandchild. 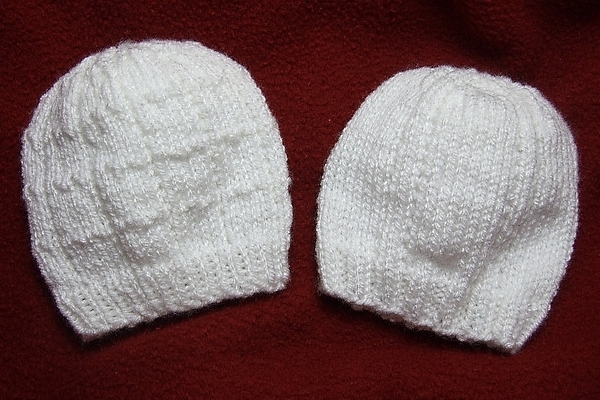 So what if I’ve already sent a baby cap, these look so enticing that I want to do them too. Guess I’ll be a specialist in baby caps until I can branch out to something else that accommodates my limited vision. Thanks so much for sharing. Actually, these caps look like what is knitted in England. Love them! I just made a toddler size and a 12 month size simple lines baby hat using the 2 needle pattern…I love these hats. I would like to make one for an adult(woman) is there an adult pattern for this hat? The easiest way to convert it is to your worsted weight yarn and size 8 (5mm) needles. Cast on 97 and make it taller than the pattern of course. I loved that I could make a hat with straight needles but what did I do wrong? I did the Square hat and ended on an even row and started the crown with row one but the top part of rows 1-9 had the purl rows showing, not the knit for the right side and I feel I followed the directions. I did not notice until I had it all sewn together and it doesn’t look right. I’m sorry it didn’t look right when completed. All the even rows should be the “wrong” side. By working an even row as the last row of the body of the hat, that last row should be a “wrong” side and then the crown would begin on row 1 with a “right side”.